Everyone wants to know how to be more photogenic. Whether you’re trying to grow your Instagram or just want to know how to look good in pictures with your friends, there are certain tips and tricks you can use to make sure you always look your best. Posing for photos is an art these days, and it’s not just for super models and actors anymore. 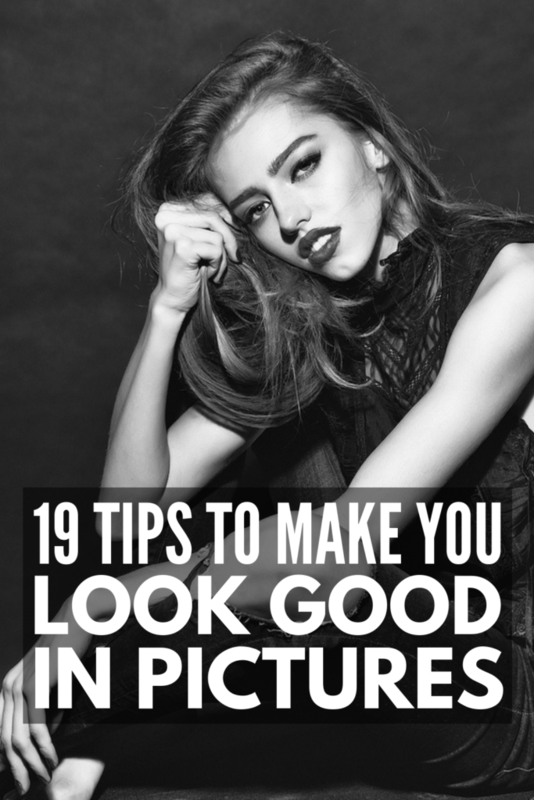 Take a look at how to look good in photos with these 19 tips. Look at photos of yourself (ones you look good in and ones you look not so good in) and determine why you look good or bad. Can you spot the differences? Perhaps you notice you look better in certain clothing options or when your hair is a certain way. You also may not like when the camera hits you on a certain angle, or notice you look much better in photos when you smile. Take note of things you do and don’t like so you can look great in photos moving forward! Practicing your most flattering poses and smiles isn’t just for models. If you want to know how to be more photogenic, you have to practice. Practice in front of a mirror or even in front of a camera to determine your best angles, poses and smiles. Try different poses and practice angling your body in familiar positions that you can re-create in front of a camera. Your outfit can make all the difference in a photo. If you don’t wear clothes that flatter your body, you likely won’t look good in photos. Choose styles and cuts that work for your body and colours that work for your complexion. The most important thing is to feel confident in whatever you’re wearing, it’s sure to shine through! Makeup can make or break your photo. It’s important your foundation is a perfect match. If it’s too pale or dark, it becomes very evident in a photo. Use a perfect match concealer to cover up blemishes and dark circles, and opt for using a translucent powder on your t-zone (forehead, nose, cheeks, chin) to keep your skin from becoming greasy. You always want your eyes to draw people in and be the focal point in photos, and there are certain things you can do to help make that happen. Curling your lashes and wearing mascara are musts. These both open up your eyes, allowing more light to hit them – that’s how you get that twinkle! The last thing you want in a photo is for your hair to look flat and lifeless. Tame frizz as camera flash can highlight flyaways, don’t use too much hair product to keep your hair from looking wet and crunchy, and flip your head over right before the picture to give it some volume (if your hairstyle allows it). Naturally, when we pose for a photo, we tend to leave our arms flat at our sides, but this can make you look awkward and uncomfortable and can also make your arms appear bigger than they are. Try posing with your hand on your hip to alleviate these issues. When you pose head on in a photo, you tend to look bigger. Turn your shoulders so you’re showing a thinner profile. You’ll look slimmer and the photo will be more flattering overall. It can be awkward figuring out what to do with your hands/arms in photos since they can enhance the nervousness you may feel. Try holding a prop like a cup of coffee or handbag to relieve your hand of awkwardness. You can also use your hand to touch your face or hair. This is a more advanced move, but with practice, can look awesome! You want to look as relaxed as possible in photos, and one of the best ways to do that is take a deep breath, relax and roll your shoulders back. This will make you look and feel more confident! Yes, your hair is totally part of your pose! If you have long hair and are wearing it down, consider whether you’ll have it in front of or behind your shoulders, or if you’ll have it all on one side or the other. You may also want to have it up. More of a visual learner? Here’s an awesome tutorial on the best photo poses you can try! If you’re forcing a smile in your photos, it’s not going to look good. Make sure your smile is as natural as possible. Relax your face and jaw muscles, engage your eyes, think about something or someone that makes you happy. And remember, practice makes perfect. Practice smiling in the mirror before getting in front of the lens. A great trick to make your smile look natural in photos is to put your tongue behind your teeth when you smile. This will help you avoid a too-wide grin that may make you look goofy. If you’re having trouble smiling naturally, ask the photographer to tell a joke or try to make you laugh. This will loosen you up and help you smile or laugh naturally to get the perfect shot. Wearing bright lipstick can also help you boost your smile in photos. While dark lipstick can make your lips look smaller, and have a dulling, aging effect on your face, bright lipstick can make your features pop! It’s a great way to enhance your smile. Some people look better when they smile with teeth, while it’s more flattering for others to smile without teeth. Practice both in the mirror to see what works best for you. If you choose to smile without teeth, it may not turn out to look like a smile at all, so practice is key! Want more tips? Check out this video on 10 tips for your best smile yet! Pull out your phone and start playing around with different angles for your face. You may think one side of your face looks better than the other, or maybe you like your head tilted back or forward. Everyone will have different angles that work for them, so play around with it and see what works best for you! Good lighting is key, and natural lighting is usually the way to go. If you’re inside make sure your blinds are open to let the light flood in. Spin around until you find the best light for your selfie. If you’re outside, make sure the sun isn’t too bright. You don’t want to be squinting in your photos. Extending your head away from your neck helps create the look of a longer neck and sharper jawline. And make sure to look up toward the camera. Holding your chin down and looking up can look really awkward. Here are more selfie tips from an instagram model herself! Posing and smiling for photos can take some practice, but using these tips will help you get the perfect shot! If you loved this post on how to look good in pictures, we’d love if you shared it on Pinterest! And if you want more beauty tips and tricks, make sure to follow our Beauty Board on Pinterest!